Read online "$ [Dollar sign] 100,000 per year from poultry. 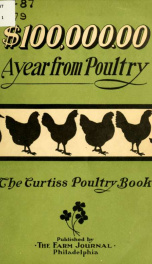 The Curtiss poultry book, being a complete and accurate account of the great plant and present successful methods of W. R. and W. J. Curtiss" by Boyer, Michael K., 1858- [from old catalog]. Instant free e-book download at OnRead.com.